I love it like a perfect yellow cupcake with not-too-sweet, fluffy pink strawberry frosting. And maybe there are some little bits of strawberry in the cake itself, but not so much that it’s soggy. 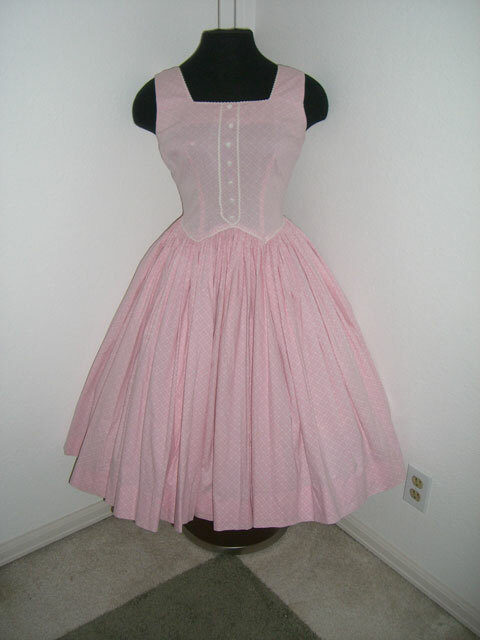 It is a PERFECT dress and a flattering cut… every single detail about it is darling, from the heart-shaped buttons to the rickrack trim to the zigzag waistline to the AMAZINGLY full skirt that a small child could get lost in for days. Even if I lost 15(!) pounds, which would officially put me at thin, I do not have the frame to fit into it. I am a Big Girl. I will never have a 24-inch waist. (Well, okay, if I lost a few pounds and got into some corset training. But that caveat is just to ward off the comments that would otherwise crop up below.) The listing has less than 24 hours to go as I write this, and there are no bids. I assume that it will be sniped in the final moments, but right now, I actually FEEL BAD FOR THE DRESS. Yes, I love the dress so much that I have anthropomorphized it, and assigned it human emotions. And right now, this dress feels like a wallflower when really, she’s prettier than a prom queen. Now that I’m thinking about cupcakes… if you’re in the Denver area, please stop by the new Lovely Confections bakery, at Colfax and Steele, where the cupcakes are made with local and organic ingredients, and the owner makes the best not-too-sweet frosting I’ve had in YEARS. Full disclosure: the owner is a friend-of-a-friend. But that does not sway my opinion of her frosting, nor does it have anything to do with how she scored a full segment on the local CBS affiliate news program tonight. My regular readers know how long-winded my posts are, so when I tell you that a friend of mine left me speechless on Thursday; not only because I didn’t know what to say, but also because there was just no way I could say anything as eloquently as he’d just done… well, that carries some weight. I know that every word was meant with complete sincerity, likewise, I know he’s wrong about some points. But he pointed out that I’d say that. He can read me like a book. A really complicated book. I laughed, I cried, I will read it again and again. It was better than Cats.